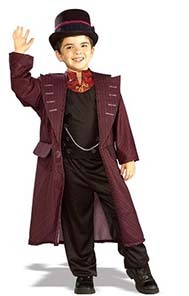 Everybody loves Roald Dahl's, Charlie and The Chocolate Factory and this Child Willy Wonka Costume perfectly captures the style of Johnny Depp's character. Included is a long burgudy coloured jacket with wide lapels and pocket detail. Attached to the jacket is a black vest with silver chain. Also included is Willy Wonka's trademark top hat which is black with a purple band.